No one expects an accident. As experienced personal injury lawyers, we have seen how quickly a serious accident can change a victim’s life. In a moment, you can go from being healthy, successful in your career, and providing for your loved ones to dealing with significant pain, being unable to work in your chosen profession, and shouldering the burden of substantial medical bills. While a lawsuit may seem daunting, it may be the only thing to repair your life and to help you and your family move forward. Broussard & David is here to guide you through each step of the process with careful attention to detail and vigorous advocacy. We have won accolades throughout Louisiana and the nation for our achievements on behalf of victims. 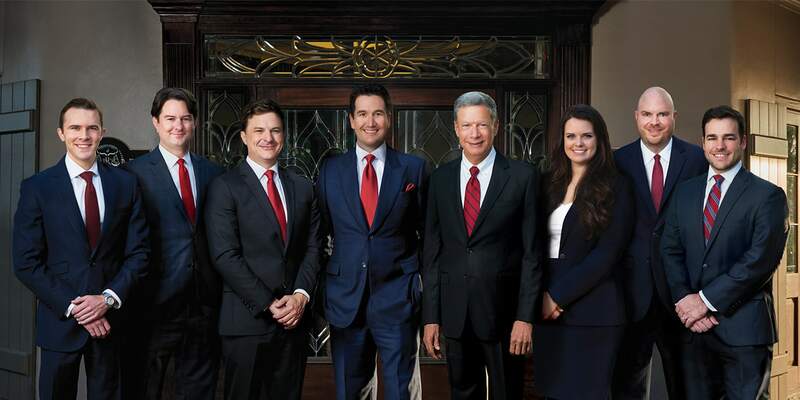 Founding partner Blake David has obtained the largest personal injury verdict in Lafayette Parish history ($30 million) as well as serving as lead counsel in the cases that resulted in the largest wrongful death awards in the history of Lafayette, Calcasieu, and St. Charles Parishes. He also has been recognized as one of the Top 100 Trial Lawyers by the National Trial Lawyers Association, while founding partner Richard Broussard has been named one of the Top 50 Lawyers in Louisiana. Both of them, as well as the rest of the team at Broussard & David, have dedicated their entire careers to protecting the rights of injured people. Personal injury cases arise from many types of accidents. In general, if someone causes your injuries because he failed to act with the appropriate level of care, that person can be held liable for the consequences of his actions. Although some aspects of the claim vary depending on the nature of the accident and the relationship between the parties, there are typically a few elements that a personal injury attorney in Lafayette needs to establish. First, we must prove that the defendant owed a duty of care to the plaintiff, and that the defendant failed to act according to that duty. Also, we have to prove that the defendant’s failure to act with the appropriate level of care was a direct and foreseeable cause of the accident. Finally, we must show that the plaintiff suffered quantifiable damages as a result. These damages can take both economic and non-economic forms, ranging from medical expenses and lost income to pain and suffering. At Broussard and David, we know the law and understand how to ask the right questions in your case. Whether it is a rear-end collision on a neighborhood street or a highway accident that occurred at high speeds, our diligent car accident lawyers have the experience you need to protect your rights. To receive compensation, you must show that the defendant did not operate his vehicle with the same reasonable care and skill that a prudent and careful driver would have used when facing the same road conditions. Car accidents can happen for many different reasons. Often, drivers are speeding, disobeying traffic laws, driving drunk , or engaging in distracted driving activities behind the wheel, such as texting or talking on the phone. Any of these activities can support a strong claim for compensation. Due to the massive size and weight of trucks, injuries resulting from a truck accident are often devastating and life-altering for a victim. Truck accidents are similar to car accidents in some respects, but there may be additional complex issues that require the attention of an experienced truck accident lawyer. Truck drivers are subject to many state and federal regulations that could be implicated in the crash. If a driver or the trucking company that hired the driver was in violation of one of these regulations at the time of the accident, our Lafayette personal injury attorneys may use this violation as a basis for proving that the defendants are liable for your damages. Louisiana’s proximity to the Gulf of Mexico has created a thriving maritime economy. In the oilfield, an operator of a boat (vessel) has broad authority over his employees as compared to on-shore employers. There are many injuries that occur on these vessels when employers abuse this authority, or take unnecessary risks in order to save time or money. Certain laws provide for compensation when an offshore worker is injured as a result of the operator’s negligence or the unseaworthiness of the vessel, but going up against large companies and insurance agencies can be daunting. We have substantial experience in maritime and admiralty laws and can ensure that you are treated fairly throughout each step of the process. Common examples of accidents in this industry include back injuries, slip and falls, welding accidents, and accidents that result from improperly navigating rough waters. If you make your living at sea, you face daily the dangers of your employment. If you are injured in an offshore accident , a personal injury lawyer at our Lafayette firm can help you assert your right to compensation from your employer, the party that caused your accident, or both. Many Louisiana residents work on cargo ships, barges, jack-up rigs, oil platforms, cruise ships, or other vessels. If the operator of the vessel, rig or platform does not maintain the work area properly or otherwise ensure that it complies with maritime or federal regulations, workers can suffer serious injuries or even death on the job. While not as common as car accidents, aviation or helicopter accidents present a disproportionate risk of serious injury. If a pilot was negligent or inadequately qualified, or if the aircraft was not maintained appropriately, we can help you take action to hold the appropriate parties accountable. Our Lafayette personal injury lawyers have assisted many victims in high-profile, catastrophic aviation injury cases that arose from offshore helicopter accidents. Founding member Richard Broussard has been a pilot for three decades and maintains a commercial helicopter pilot license. Richard’s experience as a pilot and knowledge of the industry standards gives him the ability to evaluate the facts of your case and to apply the standard of care that courts apply to aviators. There is perhaps nothing more tragic than the sudden and unexpected loss of a loved one as a result of another person’s carelessness. Louisiana laws allow the surviving relatives of the decedent to recover compensation for their loss and the associated financial costs in a wrongful death lawsuit. These damages often include lost wages, lost financial support, loss of expected future earnings, loss of companionship, and compensation for medical and funeral expenses. You can also claim compensation for your pain and suffering. To prevail in a wrongful death lawsuit, you must essentially prove that the person who caused the untimely death failed to act with the appropriate care and that this failure was a direct and foreseeable cause of the fatal accident. We know that no amount of money can ever compensate you for your loss, but it can help your family and you move forward with your lives. If you have been affected by a serious accident, our dedicated attorneys are ready to help you identify your legal options and devise a strong approach to protecting your interests. We have served victims and their families in Lafayette, Broussard, Scott, Youngsville, New Iberia, Baton Rouge, New Orleans, Lake Charles, Alexandria, Opelousas, and other areas of Lafayette, Iberia, East Baton Rouge, Orleans, Calcasieu, Rapides, and St. Landry Parishes. We can ensure that you will be treated fairly at every stage of the process as we fight for a fair outcome on your behalf. To set up your free consultation, call us at 888-337-2323 or contact us online. Richard C. Broussard and Blake R. David are NBTA Board Certified Civil Trial Advocates. Our attorneys fight for the compensation that a victim needs to get back on their feet after being struck by a careless driver. We help injured workers hurt on all types of vessels - barges, lift boats, crew boats, jack-up rigs, semisubmersibles, drill ships, cargo ships and smaller water craft - on the high seas or in inland waters. We help injured workers hurt on oil platforms offshore and in inland waters, helicopters, vessels, or docks. Seek justice from a truck driver or trucking company when you have suffered serious injuries in a preventable crash. Our attorneys have inside knowledge of the aviation industry and have handled many high-profile helicopter accident cases involving serious injuries. No matter the type of accident in which you were hurt, we can help you explore your legal options and assert your right to compensation. ‹ How does the court system help good citizens? Fill out the contact form or call us at 888-337-2323 to schedule your free consultation.